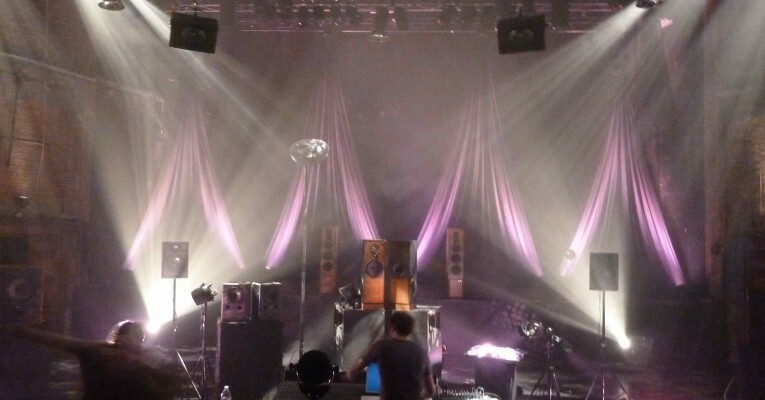 On invitation of FAQ Festival Musiques & Recherches will provide a two day programme involving acousmatic music on their 80 piece acousmonium on April 7th and 8th. The programme consists of lectures and works by a broad scale of composers ranging from classic works from the early days of acousmatic music to brand new work especially written for the festival by young composers. Compositions by i.a. : Iannis Xenakis, Denes Smalley, Pierre Schaeffer, François Bayle and Pierre Henry will be performed on the acousmonium during the festival. Acousmatic music diverges from the standards of instrumental music : composed in a studio, this music is projected live through a constellation of speakers called an acousmonium. For all live spatialized projection, “M&R” possesses his own acousmonium: a system composed of 60 projection channels and 80 speakers with different colours and orientation (Bose, Cabasse, Epicure, FAR, Tannoy, JBL…). It is designed for stereo or multiphonic (up to 32 tracks) music. The projection console can be controlled by a performer and by a composer. “Musiques & Recherches” is a non-profit association. It was founded in 1982 by Annette Van de Gorne, the current president and artistic director. It is currently the head office of the Belgian Federation of Electroacoustic Music. “M&R” is set in the countryside in an atmosphere favourable to creation and reflection. Its main aim is to promote greater awareness of today’s music among the general public, and particularly of the type of music and creation produced using electroacoustic means – acousmatic art. “M&R” is a place of creation, research, promotion, information and production. The association regularly lodges artists and helps amateur and professional artists, performers and creators interested in having access to an electroacoustic production unit. The “Métamorphoses d’Orphée” studios are composed of a digital studio with 2 octophonic systems, a 5.1. digital postproduction studio and an analog studio. Stereo and 7.1 external sound recording material is also available. In the past, these studios have welcomed major figures such as Parmegiani (FR), Gobeil (CAN), Bayle (FR), Ferreyra (ARG/FR), Parmerud (SE), Dhomont (FR), and Vaggione (ARG/FR). « M&R » also hosts Electrodoc : a unique, publicly accessible specialised resource centre gathering more than 3.000 CDs and 1.000 publications on electro-acoustic music, as well as a database available online.